Making the protagonists sisters was genius. The result, cynicism about merchandise more princess trash aside, was the promised heartwarming tale. I liked the reindeer and the snow man best. The men were mostly cardboard cutouts: disposable. (see below) Thank you, Disney, also for presenting the princesses–well, princess and queen–as attractive girls, not Barbie-esque babes. The snow monster was unnecessarily scary. The production values (computer art) are stunning. (I didn’t see the 3-D; they give me headaches.) The texture work–cloth, wood, stone–is amazing. I saw things on Blu-Ray I’d missed in the theater. Liked the fjords, clothes, stave church and rosemaling nods to Norway, and the music and decorations inspired by the Sámi culture. Quibble (and spoiler): Prince Hans’ betrayal came straight out of left field. No foreshadowing; nothing. And therefore, while it may have been necessary to the plot, it didn’t ring true. Boo. 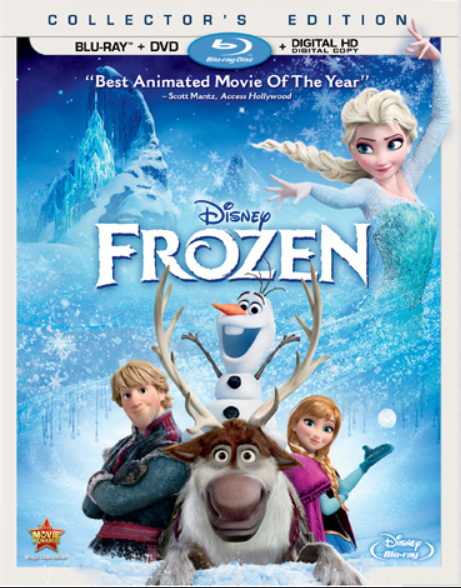 The only “extra” worth anything was the trailer featuring Olaf and Sven on ice. Too bad it couldn’t have found its way into the movie. The “Making of …” special was so stupid I turned it off halfway through. Barf. Fun for most of the family. This entry was posted in Movies, Reviews and tagged Andersen, art, C. S. Lewis, Disney, family, Narnia, Norway, reindeer, Sami, snow man, snow monster, Snow Queen, values by andreart2013. Bookmark the permalink.